Classic novels from around the world can take a while to appear in English. 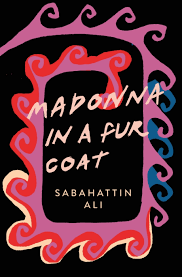 Sabahattin Ali’s Madonna in Fur Coat (originally published in 1943), however, seems only recently to have been fully appreciated in his native Turkey, translator Maureen Freely commenting (in an article in the Guardian which makes a perfect introduction to the novel) that “for the past three years, it has topped the bestseller lists in Turkey, outselling Orhan Pamuk.” Ali spent his writing life seeking to express himself freely in the face of state censorship. He was imprisoned more than once and eventually murdered at the behest of, or perhaps by, the National Security Service in 1948. His oppression is, of course, echoed in Turkey’s treatment of writers today, and Freely sees his adoption by a new generation of readers as, at least in part, an act of resistance. Maria is the stronger of the two, and often takes the lead – an idea which would have been more shocking in the 1940s, and still has the power to shock in Turkey today – and it is in this sense that the novel is political. This novel is, indeed, an unexpected treasure. You are currently browsing the archives for the Sabahattin Ali category.